Thousands of apple varieties have been registered. Some of them have been known since the 16th/17th century. Various organisations and growers are trying to maintain the traditional apple varieties and disseminate them through private enthusiasts. They often have a very fine flavour, but are not commercially viable. Well-known traditional varieties include the ‘Notarisappel’ (1890), ‘Princesse Noble’ (circa 1700), ‘Sterapple’ (circa 1800), the ancient ‘Brabantse Bellefleur’ and the delicious ‘Syden Hempje’ (circa 1750). If you would like to know more, the Royal Horticultural Society is a good place to start. Although the range of apples offered by growers is being radically updated, a number of varieties have become and remain very well-known to the general public over the years. Everyone will have eaten a ‘Cox’s Orange Pippin’ at some time. This is a keeping apple (stores well) which is ready for harvesting from mid-September. Other keeping varieties include ‘Elstar’, ‘Jonagold’, ‘Karmijn de Sonnaville’ and ‘Lombarts Calville’. The older ‘Alkmene’ and ‘Elan’ are ready for harvesting a little earlier. Real summer varieties are the self-pollinating ‘Benoni’ and ‘Summerred’. Varieties like ‘Discovery’ and the very well-known ‘James Grieve’ need other pollinators. Following ‘Elstar’ amongst others, new varieties such as ‘Gala’ and ‘Braeburn’ have also become a success recently. One of the latest apples is a cross between those two, ‘Kanzi’, which has a deliciously fresh aroma, and is juicy and crispy with a remarkable reddish pink colour. ‘Greenstar’ is another new addition, with the special feature that its flesh does not go brown when exposed to air. This makes it ideal for baking and use in salads etc. Take hold of the fruit and twist it slightly. If it comes loose easily and the stalk remains attached to the fruit, you are harvesting it at the right time. Eating apples can then be eaten immediately, keeping apples continue to ripen in storage. Be particularly careful when handling ripe fruit, since it can easily bruise. Preferably lay the fruit next to one another in shallow boxes. Keeping fruit is always picked when it is still slightly unripe. A tree with eating apples is best harvested on a rolling basis: i.e. regularly remove fruit that is ready for picking, and do not take everything off at the same time. 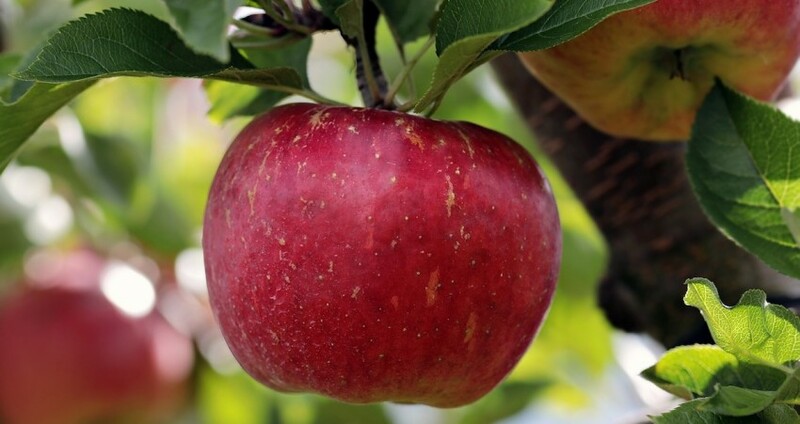 To get a good apple harvest, you usually have to have cross-pollination between different apple trees. The pollen from the flowers of one variety must pollinate those of another variety. You therefore almost always need different apple trees which must flower simultaneously. There are big variations in this. There are also apple varieties which do not provide good pollen, and are therefore almost incapable of pollinating other varieties. An example of this is ‘Schone van Boskoop’. There are few self-pollinating varieties. Some of those exceptions are ‘Summerred’, ‘James Grieve’ and ‘Benoni’. Of course you want to buy healthy fruit trees in the variety you are looking for. You can be sure of this if you buy material with a ‘certifying strip’ around the trunk. You will then be dealing with plants which have been approved by the Netherlands Inspection Service for Horticulture. Such a strip confirms the variety, the rootstock onto which it is grafted and the quality and health of the tree.